Liang Bua is a cave in a limestone hill in Manggarai regency, Flores. Local people are very familiar with this cave because of its huge size, which is about 50 meters long, 40 meters wide and 25 meters high. Due to the large size of this cave was once used as a place of worship and schools. 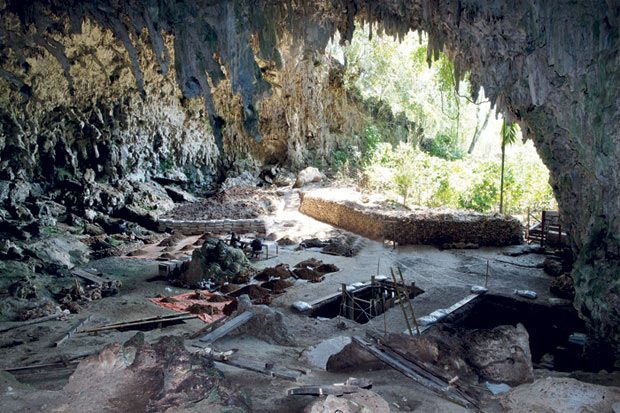 Liang Bua has been famous around the world after the discovery of an ancient human skull with short sized referred to as Homo floresiensis. The fosils found at a depth of 6 meters. The frame size of the brain is only 430 cc, which compared to a normal human being who has a brain size of 1400 cc. The archaeologists found the skull is from 2 million to 12,000 BC or during the Pleistocene era. Liang Bua is located in 14 kilometers from Ruteng, Manggarai regency capital. Bemo (local public transportation) and trucks carrying passengers from Ruteng usually pass this site but their schedule is not necessarily. The best way to visit this cave is by using a rental car or a motor taxi. To reach Ruteng, you can take land transportation from Labuan Bajo, Ende or Maumere. Every day, there are flights from Kupang to Maumere and Ende. There are also daily flights from Denpasar to Labuan Bajo, and twice a week flight from Kupang to Ruteng.